The high and mid-height front vowels of English (vowels of i and e type) have undergone a variety of changes over time, often varying from dialect to dialect. Middle English had a long close front vowel /iː/, and two long mid front vowels: the close-mid /eː/ and the open-mid /ɛː/. The three vowels generally correspond to the modern spellings ⟨i⟩, ⟨ee⟩ and ⟨ea⟩ respectively, although other spellings are also possible. The spellings that became established in Early Modern English are mostly still used today, although the qualities of the sounds have changed significantly. These /iː/ and /eː/ generally corresponded to similar Old English vowels, while /ɛː/ came from Old English /æː/. For other possible histories, see English historical vowel correspondences. In particular, the long vowels sometimes arose from short vowels, via Middle English open syllable lengthening or other processes. For example, team comes from an originally long Old English vowel, while eat comes from an originally short vowel that underwent lengthening; the distinction between these two groups of words is still preserved in a few dialects, as noted in the following section. Middle English /ɛː/ was shortened in certain words. Both long and short forms of such words often existed alongside each other during the Middle English period; in Modern English the short form has generally become standard, but the spelling ⟨ea⟩ reflects the former longer pronunciation. The words affected include several ending in d, such as bread, head, spread, as well as various others including breath, weather and threat. For example, bread was /brɛːd/ in earlier Middle English, but came to be shortened so as to rhyme with bed. In the Great Vowel Shift, the normal outcome of /iː/ was a diphthong which developed into Modern English /aɪ/, as in mine and find. Meanwhile, /eː/ became /iː/, as in feed, while the /ɛː/ of words like meat became /eː/; this later merged with /iː/ in nearly all dialects, as described in the following section. The meet–meat merger or the fleece merger is the merger of the Early Modern English vowel /eː/ (as in meat) into the vowel /iː/ (as in meet). The merger was complete in standard accents of English by about 1700. As seen in the previous section, the Early Modern English (ENE) vowel /eː/ developed from Middle English /ɛː/ via the Great Vowel Shift, while ENE /iː/ was usually the result of Middle English /eː/ (the effect in both cases was a raising of the vowel). The merger saw ENE /eː/ raised further to become identical to /iː/; this means that Middle English /ɛː/ and /eː/ have both become /iː/ in standard Modern English – meat and meet are now homophones. The merger did not affect the words in which /ɛː/ had undergone shortening (see section above), and a handful of other words (such as break, steak, great) also escaped the merger in the standard accents, acquiring the same vowel as brake, stake, grate. Hence the words meat, threat (which was shortened) and great now have three different vowels, although all three words once rhymed. The merger results in the FLEECE lexical set, as defined by John Wells. Words in this set that had ENE /iː/ (Middle English /eː/) are mostly spelt ⟨ee⟩ (meet, green, etc. ), with a single ⟨e⟩ in monosyllables (be, me) or followed by a single consonant and a vowel letter (these, Peter), sometimes ⟨ie⟩ or ⟨ei⟩ (believe, ceiling), or irregularly (key, people). Those that had ENE /eː/ (Middle English /ɛː/) are mostly spelt ⟨ea⟩ (meat, team, eat, etc. ), and in borrowed words sometimes with a single ⟨e⟩ (legal, decent, complete) or with ⟨ei⟩ or otherwise (receive, seize, phoenix, quay). There are also some loanwords in which /iː/ is spelt ⟨i⟩ (police, machine, ski); these mostly entered the language later. There are still some dialects in the British Isles which do not have the merger. Some speakers in Northern England have /iː/ or /əɪ/ in the first group of words (those that had ENE /iː/, like meet), but /ɪə/ in the second group (those that had ENE /eː/, like meat). In Staffordshire, the distinction might rather be between /ɛi/ in the first group and /iː/ in the second group. In some (particularly rural and lower-class) varieties of Irish English, the first group has /i/ while the second preserves /eː/. A similar contrast has been reported in parts of south and west England, but it is now rarely encountered there. In some Yorkshire dialects, an additional distinction may be preserved within the meat set. Those words which had original long vowels, like team and cream (which come from Old English tēam and Old French creme) may have /ɪə/, while those which had an original short vowel that underwent open syllable lengthening in Middle English (see previous section), like eat and meat (from Old English etan and mete) have a sound resembling /ɛɪ/ (like the sound heard in some dialects in words like eight and weight that lost a velar fricative). In Alexander's book (2001) about the traditional Sheffield dialect, the spelling "eigh" is used for the vowel of eat and meat, while "eea" is used for the vowel of team and cream. However, a 1999 survey in Sheffield found the /ɛɪ/ pronunciation to be almost extinct there. In certain accents, when the FLEECE vowel was followed by /r/, it acquired a laxer pronunciation. In modern General American, words like near and beer have the sequence /ir/, and nearer rhymes with mirror (the mirror–nearer merger). In RP (Received Pronunciation), a diphthong /ɪə/ has developed (and by non-rhoticity, the /r/ is generally lost, unless there is another vowel after it), so beer and near are /bɪə/ and /nɪə/, and nearer (with /ɪə/) remains distinct from mirror (with /ɪ/). A variety of pronunciations are found in other accents, although outside North America the nearer–mirror opposition is always preserved. For example, some conservative accents in northern England have the sequence /iːə/ in words like near, and just /iː/ before a pronounced /r/ as in serious. Another development is that bisyllabic /iːə/ may become smoothed to the diphthong /ɪə/ in certain words, leading to pronunciations like /ˈvɪəkəl/, /ˈθɪətə/ and /aɪˈdɪə/ for vehicle, theatre/theater and idea respectively. This is not restricted to any one variety of English; it happens in both British English and (less noticeably or often) American English as well as other varieties; although it is far more common in the former, as many Americans do not have the phoneme /ɪə/. The words which have /ɪə/ may vary depending on dialect. Dialects that have this smoothing usually also have the diphthong /ɪə/ in words like beer, deer and fear; the smoothing causes idea, Korea, etc. to rhyme with these. In Geordie, the FLEECE vowel undergoes an allophonic split, with the monophthong [iː] being used in morphologically closed syllables (as in freeze [fɹiːz]) and the diphthong [ei] being used in morphologically open syllables, not only at the very end of a word (as in free [fɹei]), but also word-internally at the end of a morpheme (as in frees [fɹeiz]). Many other dialects of English diphthongize /iː/, but in most of them the diphthongal realization is in a more or less free variation with the monophthong [iː]. Compare the identical development of the high back GOOSE vowel. Middle English short /i/ has developed into a lax, near-close near-front unrounded vowel, /ɪ/, in Modern English, as found in words like kit. (Similarly, short /u/ has become /ʊ/.) According to Roger Lass, this laxing occurred in the 17th century, but other linguists have suggested that it took place potentially much earlier. The short mid vowels have also undergone lowering, so that the continuation of Middle English /e/ (as in words like dress) now has a quality closer to [ɛ] in most accents. Again, though, it is not clear whether the vowel already had a lower value in Middle English. The merger of pin and pen in Southern American English. In the purple areas, the merger is complete for most speakers. Note the exclusion of the New Orleans area, Southern Florida, and of the Lowcountry of South Carolina and Georgia. 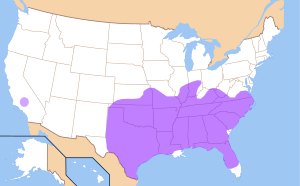 The purple area in California consists of the Bakersfield and Kern County area, where migrants from the south-central states settled during the Dust Bowl. There is also debate whether or not Austin, Texas is an exclusion. Based on Labov, Ash & Boberg (2006:68). The pin–pen merger is a conditional merger of /ɪ/ and /ɛ/ before the nasal consonants [m], [n], and [ŋ]. The merged vowel is usually closer to [ɪ] than to [ɛ]. Examples of homophones resulting from the merger include pin–pen, kin–ken and him–hem. The merger is widespread in Southern American English, and is also found in many speakers in the Midland region immediately north of the South, and in areas settled by migrants from Oklahoma and Texas who settled in the Western United States during the Dust Bowl. It is also a characteristic of African American Vernacular English. The pin–pen merger is one of the most widely recognized features of Southern speech. A study of the written responses of Civil War veterans from Tennessee, together with data from the Linguistic Atlas of the Gulf States and the Linguistic Atlas of the Middle South Atlantic States, show that the prevalence of the merger was very low up to 1860, but then rose steeply to 90% in the mid 20th century. Today there is very little variation throughout the Southern States in general, except that Savannah, Austin, Miami, and New Orleans are excluded from the merger. The area of consistent merger includes southern Virginia and most of the South Midland, and extends westward to include much of Texas. The northern limit of the merged area shows a number of irregular curves. Central and southern Indiana is dominated by the merger, but there is very little evidence of it in Ohio, and northern Kentucky shows a solid area of distinction around Louisville. Outside the South, the majority of North American English speakers maintain a clear distinction in perception and production. However, in the west, there is sporadic representation of merged speakers in Washington, Idaho, Kansas, Nebraska, and Colorado. But the most striking concentration of merged speakers in the west is around Bakersfield, California, a pattern that may reflect the trajectory of migrant workers from the Ozarks westward. The raising of /ɛ/ to /ɪ/ was formerly widespread in Irish English, and was not limited to positions before nasals. Apparently it came to be restricted to those positions in the late 19th and early 20th century. Nowadays the pin–pen merger is only commonly found in the south and southwest of Ireland. A complete merger of /ɪ/ and /ɛ/ – not restricted to positions before nasals – is found in many speakers of Newfoundland English. The pronunciation in words like bit and bet is [ɪ], but before /r/, in such words as beer and bear, it is [ɛ]. The merger is common in Irish-settled parts of Newfoundland, and is thought to be a relic of the former Irish pronunciation. center/centre sinner ˈsɪɾ̃ə(r) With intervocalic alveolar flapping. engine Injun ˈɪndʒən With weak-vowel merger. enter inner ˈɪɾ̃ə(r) With intervocalic alveolar flapping. lender Linda ˈlɪndə In non-rhotic accents. Lennon linen ˈlɪnən With weak-vowel merger. many minty ˈmɪɾ̃i With intervocalic alveolar flapping. meant it minute ˈmɪɾ̃ɪt With intervocalic alveolar flapping. tenting tinning ˈtɪɾ̃ɪŋ With intervocalic alveolar flapping. whence wince ˈwɪns With wine–whine merger. when win ˈwɪn With wine–whine merger. when's winds ˈwɪn(d)z With wine–whine merger. when's wins ˈwɪnz With wine–whine merger. A standard [ɪ], or [i] in broader accents. This is used before or after a velar consonant (lick, big, sing; kiss, kit, gift), after /h/ (hit), word-initially (inn), generally before /ʃ/ (fish), and by some speakers before /tʃ, dʒ/ (ditch, bridge). It is found only in stressed syllables (in the first syllable of chicken, but not the second). A centralized vowel [ɪ̈], or [ə] in broader accents. It is used in other positions (limb, dinner, limited, bit). Many speakers who use [ɪ̈] nonetheless replace it with [ə] in weak syllables because of the weak vowel merger. Different phonemic analyses of these vowels are possible. In one view, [ɪ] and [ɪ̈] are in complementary distribution and should therefore still be regarded as allophones of one phoneme. Wells, however, suggests that the non-rhyming of words like kit and bit, which is particularly marked in the broader accents, makes it more satisfactory to consider [ɪ̈] to constitute a different phoneme from [ɪ ~ i], and [ɪ̈] and [ə] can be regarded as comprising a single phoneme except for those speakers who maintain the contrast in weak syllables. The thank–think merger is the lowering of /ɪ/ to /æ/ before the velar nasal /ŋ/ that can be found in the speech of speakers of African American Vernacular English, Appalachian English, and (rarely) Southern American English. For speakers with the lowering, "think" and "thank", "sing" and "sang" etc. can sound alike. The weak vowel merger is the loss of contrast between /ə/ (schwa) and unstressed /ɪ/, which occurs in certain dialects of English. In speakers with this merger the words abbot and rabbit rhyme, and Lennon and Lenin are pronounced identically, as are Rosa's and roses and addition and edition. (Speakers without the merger generally have /ɪ/ in the final syllables of rabbit, Lenin, roses and the first syllable of edition, distinct from the schwa heard in the corresponding syllables of abbot, Lennon, Rosa's and addition.) If an accent having the merger is also non-rhotic, then for example chatted and chattered will be homophones. The merger also affects the weak forms of some words, causing unstressed it, for instance, to be pronounced with a schwa, so that pig it would rhyme with bigot. The merger is very common in the Southern Hemisphere accents. Most speakers of Australian English replace weak /ɪ/ with schwa, although in -ing the pronunciation is frequently [ɪ]; and where there is a following /k/, as in paddock or nomadic, some speakers maintain the contrast, while some who have the merger use [ɪ] as the merged vowel. In New Zealand English the merger is complete, and indeed /ɪ/ is very centralized even in stressed syllables, so that it is usually regarded as the same phoneme as /ə/. In South African English most speakers have the merger, but in more conservative accents the contrast may be retained (as [ɪ̈] vs. [ə]; see kit split, above). The merger is also commonly found in General American. In Southern American English, however, the merger is generally not present, and /ɪ/ is also heard in some words that have schwa in RP, such as salad. In Caribbean English schwa is often not used at all, with unreduced vowels being preferred, but if there is a schwa, then /ɪ/ remains distinct from it. In RP, the contrast between /ə/ and weak /ɪ/ is maintained. In other accents of the British Isles behavior may be variable; in Irish English the merger is almost universal. Even in accents that do not have the merger, there may be certain words in which traditional /ɪ/ is replaced by /ə/ by many speakers (here the two sounds may be considered to be in free variation). In RP, /ə/ is now often heard in place of /ɪ/ in endings such as -ace (as in palace), -ate (as in senate), -less, -let, for the ⟨i⟩ in -ily, -ity, -ible, and in initial weak be-, de-, re-, and e-.. This final /əl/, and also /ən/ and /əm/, are commonly realized as syllabic consonants. In accents without the merger, use of /ɪ/ rather than /ə/ prevents syllabic consonant formation. Hence in RP, for example, the second syllable of Barton is pronounced as a syllabic [n̩], while that of Martin is [ɪn]. Particularly in American linguistic tradition, the unmerged weak [ɪ]-type vowel is often transcribed with the barred i ⟨ɨ⟩, the IPA symbol for the close central unrounded vowel. Another symbol sometimes used is ⟨ᵻ⟩, the non-IPA symbol for a near-close central unrounded vowel; in the third edition of the OED this symbol is used in the transcription of words (of the types listed above) that have free variation between /ɪ/ and /ə/ in RP. Aaron Erin ˈɛrən With Mary-marry-merry merger. barrel beryl ˈbɛrəl With Mary-marry-merry merger. modern modding ˈmɒdən Non-rhotic with G-dropping. pattern patting ˈpætən Non-rhotic with G-dropping. Happy tensing is a process whereby a final unstressed i-type vowel becomes tense [i] rather than lax [ɪ]. This affects the final vowels of words such as happy, city, hurry, taxi, movie, Charlie, coffee, money, Chelsea. It may still apply in inflected forms of such words containing an additional final consonant sound, such as cities, Charlie's and hurried. It can also affect words such as me, he and she when used as clitics, as in show me, would he? Up to the 17th century it was possible for words like happy to end with the vowel of my (originally [iː], but diphthongized in the Great Vowel Shift); this alternated with a short i sound which led to the present-day realizations. (Many words spelt -ee, -ea, -ey formerly had the vowel of day; there is still alternation between that vowel and the happy vowel in words such as Sunday, Monday.) It is not entirely clear when the vowel underwent the transition. The fact that tensing is uniformly present in South African English, Australian English, and New Zealand English implies that it was present in southern British English already at the beginning of the 19th century. Yet it is not mentioned by descriptive phoneticians until the early 20th century, and even then at first only in American English. The British phonetician Jack Windsor Lewis believes that the vowel moved from [i] to [ɪ] in Britain the second quarter of the 19th century before reverting to [i] in non-conservative British accents towards the last quarter of the 20th century. Conservative RP has the laxer [ɪ] pronunciation. This is also found in Southern American English, in much of the north of England, and in Jamaica. In Scottish English an [e] sound, similar to the Scottish realization of the vowel of day, may be used. The tense [i] variant, however, is now established in General American, and is also the usual form in Canada, Australia, New Zealand and South Africa, in the south of England and in some northern cities (e.g. Liverpool, Newcastle). It is also becoming more common in modern RP. The lax and tense variants of the happy vowel may be identified with the phonemes /ɪ/ and /iː/ respectively. They may also be considered to represent a neutralization between the two phonemes, although for speakers with the tense variant, there is the possibility of contrast in such pairs as taxis and taxes (see English phonology – vowels in unstressed syllables). Modern British dictionaries represent the happy vowel with the symbol ⟨i⟩ (distinct from both ⟨ɪ⟩ and ⟨iː⟩). Old English had the short vowel /y/ and long vowel /yː/ which were spelled orthographically with "y" which contrasted with the short vowel /i/ and the long vowel /iː/ which were spelled orthographically with "i". By Middle English the two vowels /y/ and /yː/ merged with /i/ and /iː/, leaving only the short-long pair /i/-/iː/. Modern spelling therefore uses both "y" and "i" for the modern KIT and PRICE vowels. Modern spelling with "i" vs. "y" is not an indicator of the Old English distinction between the four sounds, as spelling has been revised since after the merger occurred. After the merger occurred, the name of the letter "y" acquired an initial [w] sound in it, to keep it distinct from the name of the letter "i". The mitt–meet merger is a phenomenon occurring in Malaysian English and Singaporean English in which the phonemes /iː/ and /ɪ/ are both pronounced /i/. As a result, pairs like "mitt" and "meet", "bit" and "beat", and "bid" and "bead" are homophones. The met–mat merger is a phenomenon occurring in Malaysian English, Singaporean English and Hong Kong English in which the phonemes /ɛ/ and /æ/ are both pronounced /ɛ/. For some speakers, it occurs only in front of voiceless consonants, and pairs like "met", "mat", "bet", "bat" are homophones, but "bed", "bad" or "med", "mad" are kept distinct. For others, it occurs in all positions. The met–mate merger is a phenomenon occurring for some speakers of Zulu English in which /eɪ/ and /ɛ/ are both pronounced /ɛ/. As a result, the words "met" and "mate" are homophonous as /mɛt/. ^ Barber, C. L. (1997). Early Modern English. Edinburgh University Press. p. 123. ^ a b Alexander, D. (2001). Orreight mi ol'. Sheffield: ALD. ISBN 978-1-901587-18-0. ^ a b Wakelin, M. F. (1977). English Dialects: An Introduction. London: The Athlone Press. ^ Wells (1982), pp. 140–141. ^ Wells (1982), pp. 196, 357, 418, 441. ^ Stoddart, J.; Upton, C.; Widdowson, J. D. A. (1999). "Sheffield Dialect in the 1990s". In Foulks, P.; Docherty, G. Urban Voices: Accent Studies in the British Isles. London: Edward Arnold. pp. 72–89. ^ Wells (1982), pp. 153, 361. ^ Wells (1982), p. 153. ^ Stockwell, R.; Minkova, D. (2002). "Interpreting the Old and Middle English close vowels". Language Sciences. 24 (3–4): 447–457. doi:10.1016/S0388-0001(01)00043-2. ^ McMahon, A., Lexical Phonology and the History of English, CUP 2000, p. 179. ^ Kurath, Hans; McDavid, Raven I. (1961). The Pronunciation of English in the Atlantic States. Ann Arbor, Michigan: University of Michigan Press. p. 103. ISBN 978-0-8173-0129-3. ^ Morgan, Lucia C. (1969). "North Carolina accents". Southern Speech Journal. 34 (3): 223–29. doi:10.1080/10417946909372000. ^ a b Brown, Vivian (1990). The social and linguistic history of a merger: /i/ and /e/ before nasals in Southern American English. PhD dissertation, Texas A & M University. ^ Brown, Vivian (1991). "Evolution of the merger of /ɪ/ and /ɛ/ before nasals in Tennessee". American Speech. 66 (3): 303–15. doi:10.2307/455802. JSTOR 455802. ^ a b Labov, William; Ash, Sharon; Boberg, Charles (2006). The Atlas of North American English. Berlin: Mouton de Gruyter. ISBN 978-3-11-016746-7. OCLC 181466123. ^ Wells (1982), p. 423. ^ Hickey, R. (2004). A Sound Atlas of Irish English. Walter de Gruyter. p. 33. ^ Clarke, S. (2005). "The legacy of British and Irish English in Newfoundland". In Hickey, R. Legacies of Colonial English. Cambridge University Press. p. 252. ^ Wells (1982), pp. 612–3. ^ Rickford, John R. (1999). "Phonological and grammatical features of African American Vernacular English (AAVE)" (PDF). African American Vernacular English. Malden, MA & Oxford, UK: Blackwell. pp. 3–14. ^ Wells (1982), p. 167. ^ Wells (1982), pp. 601, 606, 612. ^ Wells (1982), pp. 550, 571, 612. ^ Wells (1982), pp. 167, 427. ^ Wells (1982), p. 296. ^ Flemming, E.; Johnson, S. (2007). "Rosa's roses: reduced vowels in American English". Journal of the International Phonetic Association. 37 (1): 83–96. doi:10.1121/1.4783597. ^ Wells (1982), pp. 165–166, 257. ^ "Changes in British English pronunciation during the twentieth century", Jack Windsor Lewis personal website. Retrieved 2015-10-18. ^ Wells (1982), pp. 165, 294. ^ a b Tony T. N. Hung, English as a global language: Implications for teaching. Retrieved 27 September 2008.